We bring you 100% mesh Pumpkin Lanterns, which are only 1 Land Impact each, are copyable, and come in 3 types. The two floating versions turn gently at random speed and direction. All of the lanterns are able to emit fog – just click to turn it on and off. 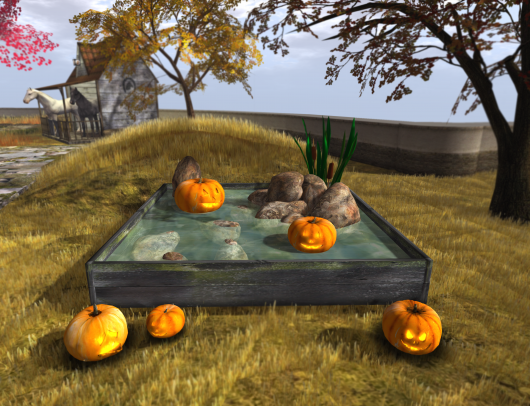 The Floating Pumpkins also look great on prim water and on land. In the above image, you can see the -Hanaya- Garden Pond. 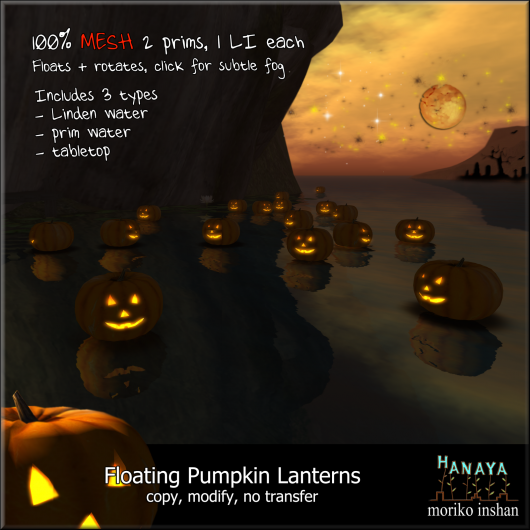 -Hanaya- Floating Pumpkin Lanterns and the Garden Pond are sold at our in-world store, as well as on the Second Life Marketplace. Single copies of the pumpkins with several different scary faces are also available. This entry was posted in Product Announcements and tagged all hallows eve, autumn, fall, halloween, pumpkin on September 26, 2012 by moriko. Welcome to a sneak peek at our brand new 100% original mesh creation – a series of horse barns, which will be available for sale Friday, September 14th. Our passion for quality and love for horses shows in the details of these barns – smooth edges that prevent scrapes. Entrance gates which swing open at a touch and high quality, easy-to-clean stone flooring.All 5 of our brand new barns are super low prim and feature custom textures and horse decals that make these barns unique. Super low prim you ask? Yes – only 9 LI or 9 prims in total. Including barn, gates and lantern. Miniatures of all models are on display at our in-world store. Please set your viewer LOD to a minimum of 4.0. The Muskoka Horse Barn was created for my friend Fiona to blend into her landscape on Long Island Sound. Built from two-tone bleached birch and topped with a dark clay roof, the muted tones are a good neutral colour choice for many landscapes. Texas – Horse Country USA. Home of the desert sun and horses, horses, horses. Did you know that Texas has the largest number of horses in the entire US? Our El Paso Horse Barn is brick and stucco on the outside with wood paneling inside. Just right for your prized Quarter Horses, Thoroughbreds, Paints, Arabians and Appaloosas. Inspired by last year’s vacation to Sweden, the Småland version of the barn is built from rough cut timber painted a cheery red. The clay tiles of the roof work well with the faded white wood beam infrastructure. Since the Thousand Islands region of the St. Lawrence Seaway is near and dear to my heart, we bring you a barn built from reclaimed mossy cedar planks reminiscent of my family’s old cottage. Topped with a red clay roof and contrasting beam work, this barn will look lovely in any northern setting, especially in the autumn. Named after St. Gotthard Pass, a wonderland of perpetual snow in the Swiss Alps. Although our last trip through the pass was in a car last May, stories are told of sturdy horses carrying merchants crossing over the old cobbled pass from Italy into Switzerland and resting at a way point near the top of the pass. 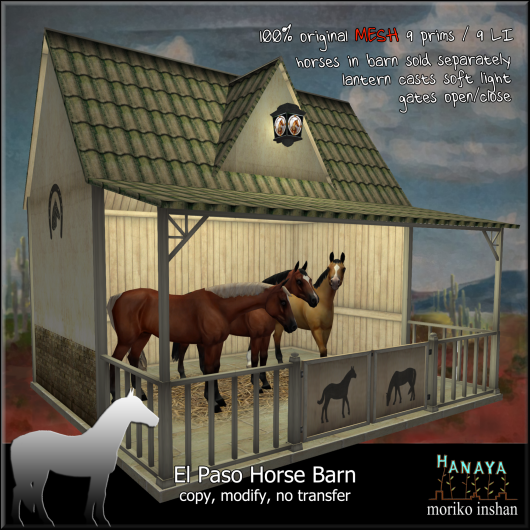 All five variants of our Horse Barn will be available for sale at our in-world store and on the Second Life Marketplace on Friday, September 14th. Demo available. This entry was posted in Product Announcements and tagged El Paso, horse barn, Muskoka, St. Gotthard, St. Lawrence on September 13, 2012 by moriko. As summer starts winding its way toward the fall, our thoughts turn toward the rich colours, smells and activities of autumn. One such activity for us is to remove nesting boxes and clean our bird feeders, getting them ready for our feathery friends. 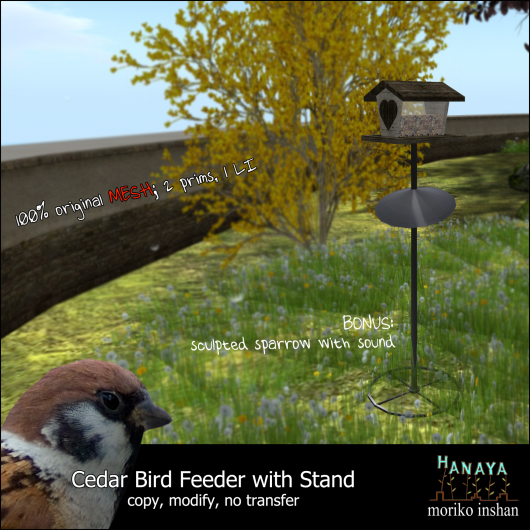 -Hanaya- brings you 3 versions of our mesh, low land impact wooden bird feeder. Our Cedar Bird Feeder with Hanger enables you to suspend the feeder from a tree branch, or perhaps a simple side-mounted pole attached to your home or gazebo. 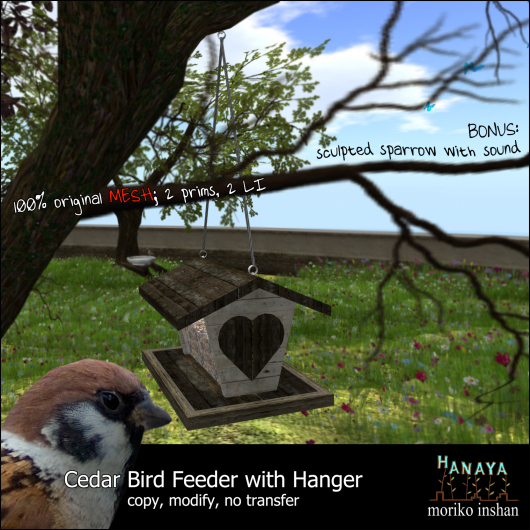 This lovingly created and textured feeder is 2 prims / 2 LI, and includes a sculpted singing sparrow as a bonus. The Cedar Bird Feeder that is part of the set is only 1 prim / 1 LI, and is suitable for placing on a ledge or patio (watch out if you have cats though). 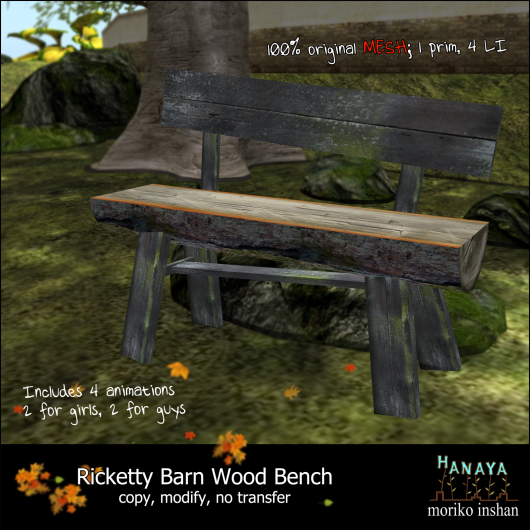 Or place it on the sculpted 1 prim picnic table, which is part of the set. Also included are 5 different birds, as shown in the above image – all with bird song that is scripted for daytime and night time. Do you have troubles with squirrels getting into your bird seed? The Cedar Bird Feeder with Stand includes a free-wheeling baffle that guards the feeder from pesky little squirrels. And don’t feel too bad – the birds will scatter enough seed on the ground for the squirrels to have something to eat. This version of the feeder also includes a sculpted sparrow with night time and daytime bird song. Now that we have placed bird feeders in our garden, we need a place to sit quietly and take in the sounds and sights of early autumn. What better, then a simple bench made from reclaimed barn boards and Amish hand-crafted wood nails that we found while driving through the backwoods of upper New York State. The bench seats 2 and is suitable for PG environments. 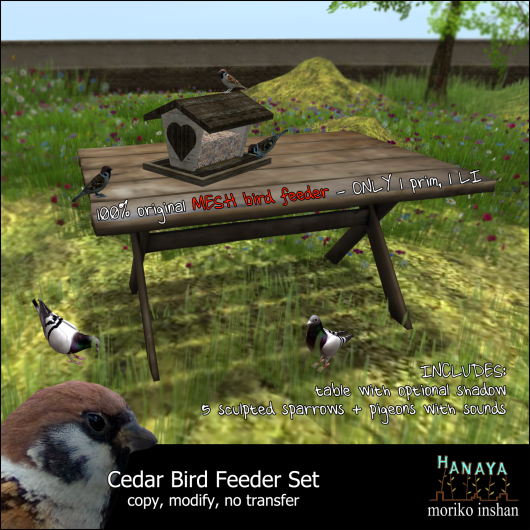 All versions of the bird feeder, as well as the bench are on display at our in-world store, and are available for sale there, as well as on the Second Life Marketplace. This entry was posted in Product Announcements on September 3, 2012 by moriko. First, a big thank you to everyone that visited and shopped at our booth at Vintage Fair. It seems like many of you guys still like primmy flowers and furniture with flowers and heaps of frilly pillows. YAY! 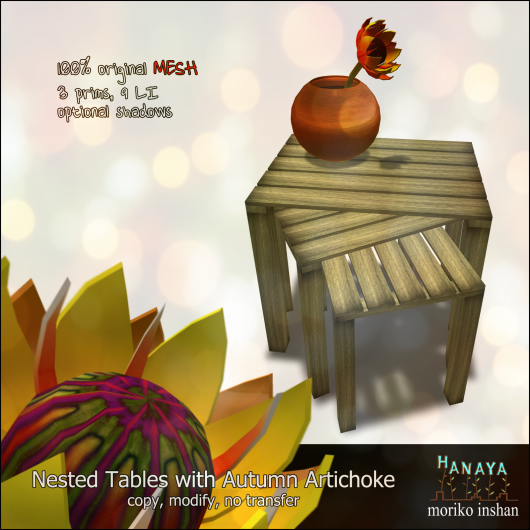 The -Hanaya- My Romance furniture collection is now available for sale at our in-world store as well as on the Second Life Marketplace. Also on display and available for sale is our Three Tier Cake with animations, as well as vintage botanical prints and keepsake boxes. September is here, and so is the monthly group gift for -Hanaya- Yummy Collectibles in-world group. A one prim, one Land Impact set of 3 nested tables in modify/copy permission so that you can resize and retexture as you like. The tables are topped with a simple wood-turned bowl, which contains my version of autumn artichokes that have been blooming in my real life garden. The gift has been sent out on the group, but will remain available at our in-world store during the month of September. We are excited to announce that -Hanaya- will be participating in 2 cool events in October. First, is Cinema! An awesome event being organized by the talented RubyStarlight Writer, who brought us Festival of Sin last winter. I don’t want to let the cat out of the bag yet and share too many details, so for now I will just say think sci-fi. The other event we will take part in October in is Halloween Party. This entry was posted in Events, Freebies and Gifts and tagged Cinema! group gift on September 1, 2012 by moriko.